New Products on Sale @Alcher Interiors – June 8-19th – 20% OFF | Alcher Interiors, Inc. Select blue & white patterns on sale over the next two weeks, June 8 – 19, at 20% Off. A carpet by Langhorne is shown with Imperial Blue rocks, creating a wonderful, relaxing combination for a three-season or great room. Frost-resistant blue and gold 2 x 2 tiles are paired with a 4 x 4 pattern tile – wonderful for pool surrounds, a kitchen backsplash, or an outdoor kitchen. 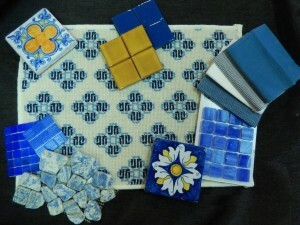 These can be beautifully accented with Pisazza or Stone & Pewter accents 1 x 1 mosaics. Fabrics by Malabar round out the offering, and are perfect for pillows, seat cushions or drapery. Visit Alcher Interiors’ premier tile showroom for all of your tile needs, including kitchens and bath. We offer glass and handmade tiles, but also have tile for every budget!